This simple shampoo bar recipe is amazing. It’s easy to make and packs a punch of healthy oils that will moisturize your hair without weighing it down or making it feel greasy. If you want to use different essential oils that are better suited to your hair then the essential oils in this recipe can be easily substituted. For greasy hair you can use the following essential oils: Basil, Cypress, Thyme, Lemon or Rosemary. For hair loss you can use the following essential oils: Lavender, Ylang Ylang, Cedarwood, Clary Sage or Rosemary. Shea butter is perfect for taming frizzy hair making it manageable, sealing the moisture into your hair without leaving it feeling greasy and it can help with scalp issues, like dandruff. Tea tree oil will help cleanse your hair without drying it out or causing damage. It can also help unclog hair follicles and encourage growth. Like the shea butter, it can also help with dandruff. Peppermint is another oil that can invigorate hair follicles and promote hair growth. It does this by helping to improve blood flow. Orange oil is antiseptic, anti-inflammatory, helps add vitamins to your hair, is a great moisturiser and has a glorious citrus scent. Olive oil and coconut oil are great moisturisers and will lock in the moisture, giving your hair a lovely shine. Place the soap moulds on an even surface so they are ready and waiting. Cut the soap base into squares. You can use the microwave or double boiler method for the first few steps. If using the microwave, put your soap cubes in a microwave safe bowl and heat for 30 seconds. Stir and repeat until your soap base has melted. Once melted add shea butter to the bowl and heat for an additional 30 seconds. If you are using the double boiler method, place a pot of water on your stove over medium heat. Put your soap cubes into a large, glass mason jar and set it in your pot. Stir the soap base until it is melted and then add the shea butter to the jar. Stir to incorporate the shea butter and then remove from the heat. Add the coconut oil and olive oil to the mixture and stir well. Now it is time to add the essential oils. Add 10 drops of tea tree essential oil, 5 drops of orange essential oil, 5 drops of peppermint essential oil and 10 drops of Clary Sage essential oil to your melted soap. Then, mix in the sea salt. Add orange zest and mix gently. Spray the bottom of your mold with rubbing alcohol. This will help the soap to release from the mould, however it is an optional step. Pour the soap mixture into the moulds, filling to the brim. Let your mold rest until the soap has a chance to harden, this will take at least an hour. When the soap is hard it is ready for use. To use, apply the wet shampoo bar directly to your hair, all over your head, working from the scalp down, and gently massage until a lather forms. Or you can rub the shampoo bar between your hands until you create a good lather and then apply to your hair from the scalp down. Work the lather into your hair and then make sure to rinse very well. 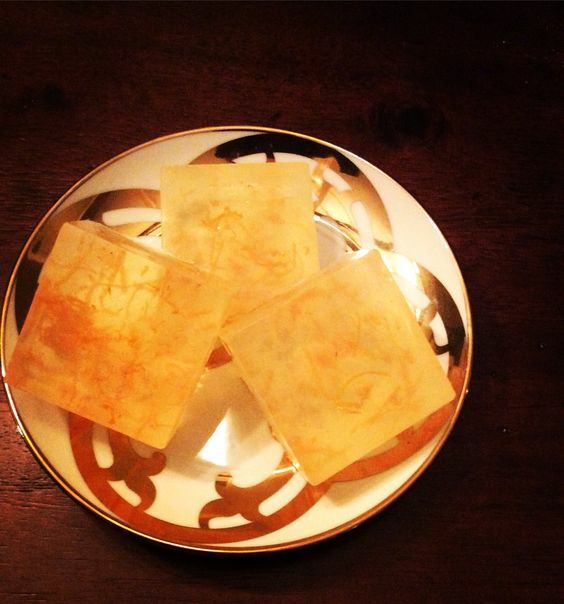 Store extra soap bars in an airtight container or wrap in parchment.